The Chakra connection is my attempt at a grand unified theory of aging, based on the merging of the physical and metaphysical (spiritual) aspects of human beings. The Five Tibetan Rites is an ancient system of antiaging exercise to address this aspect of aging. First let me warn you that what I am going to say is PURE SPECULATION on my part. I have no scientific evidence to back up this up, but again, I look to patterns and convergence of aging theory and fact to try and figure out what might be happening. I am proposing that the primary driver of aging is the neuroendocrine system, and that all other manifestations of aging are secondary to the decline in your critical hormones. I say this because we know from evidence that hormone replacement therapy can greatly increase general health and the quality of life. However there is another reason. I call it the chakra connection! The ancients in India, and Tibet, two of the oldest cultures in existence believed that our spiritual bodies are connected to our physical bodies by what are called Chakras. These are energy vortexes that as you might have guessed tend to become less energized with age. The Chakras, (there are 7 of them) correspond with your endocrine glands (hormonal system) and the energy from the Chakras is said to in turn energize these glands and keep our hormonal system functioning strongly. 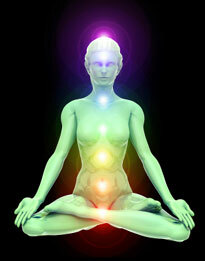 The 7 Chakras can be balanced and re-energized using a system of exercises called the Five Tibetan Rites. These five rites or exercises were allegedly used by the Lamas of Tibet to maintain the energy and vitality of their Chakras and ward off old age. This is the Chakra connection! Perhaps the reason why science is not able to pinpoint the root cause of aging is because they are unwilling to consider this spiritual connection as a possibility. To them, it just isn’t…. “Scientific!” Aging theory must conform to known science not metaphysics. Is Chakra Re-Energizing the Answer? ” talks about the human body as a form of high-tech machine that the encases the spiritual body and allows it to function on the physical plane. You may find this “too far out” to take seriously, but this conception of the body does seem to provide answers to some perplexing questions about aging theory and the nature of life. This may sound like mythology, but when you consider that the Chakras correspond to our endocrine glands it begins to make sense. If these Chakras are indeed the interface point between the spiritual and physical parts of ourselves, then it would make sense that the root of aging occurs when the energy in the Chakras begins to decline. That decline would then manifest itself in the deterioration of our endocrine glands and the critical hormones they produce. This chain of events would inevitably lead to deterioration in all body systems. The good news is that daily performing of the Five Tibetan Rites is said to re-energize the Chakras, and rejuvenate the body. These simple and non-strenuous exercises can be learned and performed by anyone. You don’t have to be a Tibetan Lama, just care enough about your body to invest the time (about 10 minutes a day) to perform them. Could true antiaging be THAT simple? Well, the ancients keep surprising us with their knowledge of the body, so I would be willing to bet they knew what they were doing and that the Chakra connection I have proposed is more accurate than not. You can get more information about the Chakras and the Five Tibetan Rites by clicking on the link below!